Mumbai : The Red Boys Foundation is a team of dedicated individuals working toward the development of youth in the slums of Mumbai. India is home to 356 million people between the ages of 10 and 24. This makes India the youngest country in the world. While higher number of youngsters has the potential to build a nation, our demographic advantage can go untapped given a sizeable portion of our youth remains illiterate and unskilled. More worrying is the influence of drugs, and lack of help and guidance almost everyone needs in abundance. This is where the Red Boys Foundation steps in. Born out of a slum, it is an organisation that focusses on youth development, and helps them aspire for a better life. With a strong desire to make a difference, back in 2007, a young boy named Zakir Khan dreamt of a day he would be able to satisfy his longing. This gave birth to the Red Boys Foundation in the year 2012. 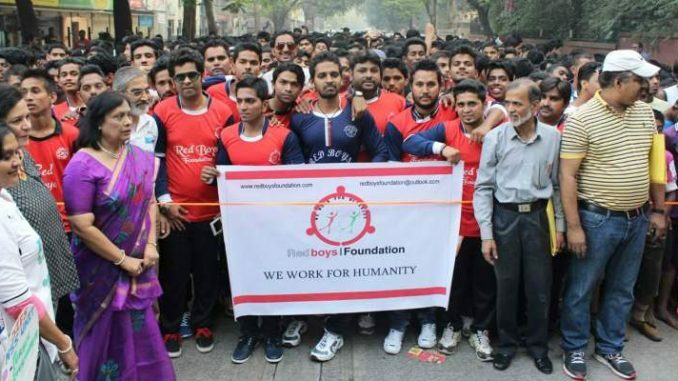 An NGO that productively juggles between a number of activities, the Red Boys Foundation was founded by Zakir, 29 and Shahnawaz Shaikh, 28. Starting out in Bharat Nagar, a slum in Mumbai, Zakir, along with a few young professionals and students, joined hands for the initial plan of building better relations within the community. Later, in 2011, studying the conditions of education and poor career counselling in the slum areas the Red Boys Foundation came into being. Officially registered in April, 2014 under the Society’s Act of 1860, the team began working much more aggressively for the youth and the community. They work to help underprivileged children and youth coming from various slums in Mumbai understand their complete potential and recognise their capabilities. From meeting in a small room in Bharat Nagar, the Red Boys Foundation today has core team of young professionals from diverse fields. It includes an architect, an advocate, a counsellor for women issues, an engineer, a social activist and young college students. Using their expertise, they help mitigate the troubles families and youngsters in the slums face. These professionals have a day job along with which they work as part of this NGO. The team struck a chord with the people in Bharat Nagar mainly because they come from the same area and background of lower middle-class families who live on either daily wages or a monthly salary. The team and volunteers go around different targeted slums in Mumbai and meet with young adults, especially ones under the influence of drugs. They conduct a one-on-one counselling session trying to tap into their skill set. Once the potential in a student or a confused youth is identified, the team monitors their activities by providing guidance each step of the way, be it finding that job they always wanted or a scholarship to pursue higher education. The Red Boys Foundation functions without reliance on funding from different sources or donors. The group members pool in money from their own pockets to host these social events. “We started with the simple belief that human beings have limitless potential. We believe that the right character and skills offers the most potential to break the cycle of poverty and help the less-privileged communities lead empowered lives,” says Shahnawaz.